LA HABRA – It has long been said that timely hitting is an essential part of successful baseball. That important feature served Whittier Christian High School well in Friday’s crucial Olympic League game against Heritage Christian. Senior designated hitter Josh McGee came through with the game’s biggest hit, a two-run single that helped lift the host Heralds to a 3-2 victory over Heritage Christian. McGee’s hit capped a successful comeback by the Heralds, who overcame a 2-0 deficit after the fifth inning. Friday’s triumph elevated Whittier Christian (13-9 overall, 5-3 in league) into first place in league. “Any Olympic League win is a big win,” Heralds coach Brent Lavoie said. “We won at a time when we needed one. We’ve been playing nothing but close games in league. It usually comes down to one play or one pitch to decide the outcome. Whittier Christian started its rally in the bottom of the sixth inning. Sophomore catcher Cooper Hughes led off with an infield single, and after two consecutive groundouts advanced Hughes to third, sophomore second baseman/pitcher Mike Rubio extended the inning by drawing a walk. Junior utility player Joseph Cobian then delivered a run-scoring single to make it 2-1. That set the stage for McGee, who singled in two runs to make it 3-2. Heralds junior starting pitcher Mike Rafter, who earned the victory, scattered seven hits in six innings. Rubio, who pitched a scoreless seventh, earned the save. Senior infielder David Clark collected a team-high two hits for Heritage Christian (12-7, 3-3). Warriors senior pitcher Jake Hasse went the distance, allowing 10 hits in six innings. Heritage Christian took a 2-0 lead in the fifth. 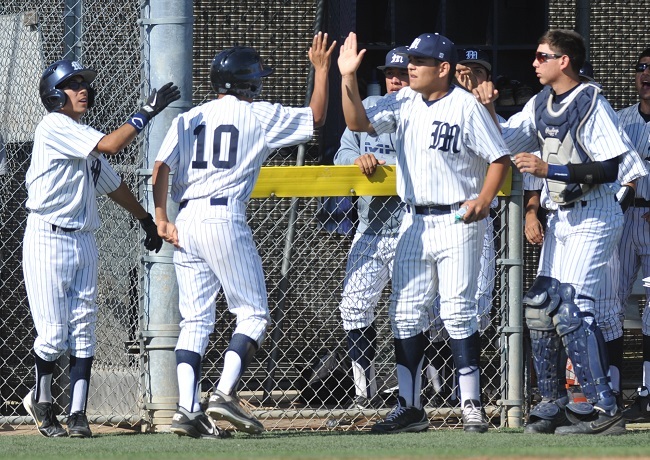 Clark started off the rally by reaching first base on a Whittier Christian error. He then advanced to third base on back-to-back groundouts. Then senior shortstop Tanner Marcoe gave the Warriors a 1-0 lead with an infield single. Hasse then helped his own cause by delivering a run-scoring double to right. Rafter, however, got out of the inning by retiring Eric Gordon on a grounder to first. Cobian led the Heralds offensively with three hits. Rubio and sophomore outfielder J.J. Farrell each added two hits. Whittier Christian will have a bye next week in league play. The Heralds’ next league game is scheduled for April 30 against Valley Christian. LA PUENTE – The mark of a good baseball team is to win when it’s not at its best. Bishop Amat High School proved that adage Friday by getting an RBI single with with one out in the seventh inning for a 3-2 victory over visiting St. Paul in a Del Rey League game. The Lancers, who overcame four errors and four walks from three pitchers to beat the Swordsmen for the second time this week, improved to 9-10 overall and 2-2 in league. St. Paul, which had tied it at 2-2 on a throwing error in the sixth, slipped to 15-9 and 2-2. “Good teams find a way to access damage control,” Bishop Amat coach Andy Nieto said. “That’s what it was. We got ourselves in difficult situations. “But we have a motto of if you give up one, fight hard to not give up two; if you give up two, fight hard to not give up three and so on. 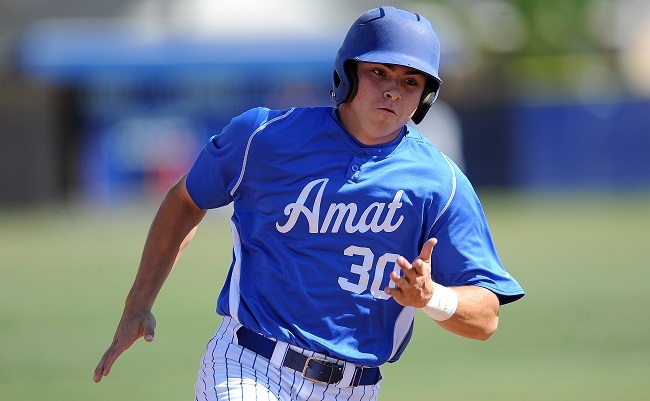 It also left the door open for Amat to get the win, and Adam Alcantara didn’t let that opportunity go to waste. It was set up after pinch-hitters Andrew Dela Cruz and Luis Moya and Scott Hurst walked to load the bases with one out. Alcantara then grounded a 3-2 pitch from reliever Aaron Pinto through the drawn-in infield into center field to win it. “With the bases loaded and only one out, you’re basically looking for a pitch to drive, up the gap, up the middle,” Alcantara said. “I was also looking to get it in the air and get a sacrifice fly, too. St. Paul, which was held to three hits, had rallied to tie it at 2-2 by scoring a run in the fourth and sixth innings, each time taking advantage of a Bishop Amat miscue. Gabriel Esquer led off the fourth with a walk, then advanced to third on a throwing error on a sacrifice bunt attempt. He scored on a safety squeeze by Zack Ramsay. Esquer walked to lead off the sixth. He advanced to second on a sacrifice and scored with two outs following a throwing error on a dropped third strike. “You win games by getting clutch hits,” St. Paul coach Casey Morales said. “Big guys make big plays. When there’s runners out there, that’s when you have to get the hit, not when there’s nobody on base and there’s two outs. When you go 1 for 3 then, that doesn’t mean anything. MONTEBELLO – Montebello High School pitcher Daniel Lopez was 0 for 3 with three strikeouts Friday, but not one of his teammates or coaches cared. They even gathered in the dugout after the game for a mock cheer for his at-bats. Things are going quite well for the Oilers baseball team, which defeated visiting Alhambra, 3-1, behind a complete-game, two-hit performance by Lopez in an Almont League game Friday. Montebello (10-7, 8-1) is in prime position to win its first outright league title since the 2004 season when it won back-to-back crowns. Alhambra (10-6, 7-2) has won the league championship the past eight years. Both teams still have six league games remaining, but if the Moors have any thoughts of winning their ninth consecutive title, they must get some help. “Just the fact that we’re a game up and we now have the tiebreaker in case there is a tie, it puts us in a good situation,” Montebello coach Rafael Gutierrez said. Montebello scored a run in the first inning for a 1-0 lead on a single by junior catcher Ryan Orozco (2 for 3) that scored shortstop Andrew Jimenez (1 for 3). Jimenez advanced to second on a throwing error by Alhambra pitcher Jose Amezquita (six strikeouts) and went to third on a wild pitch. Alhambra, which reached the CIF-Southern Section Division 3 final last season, tied the game 1-1 in the third inning. Senior second baseman Andrew Arroyo singled, was sacrificed to second by catcher Brandon Morales and moved to third on an infield out. He then came home on an infield single by right fielder Jonah Lybarger, who advanced to second when Jimenez threw the ball low to first. Alhambra had a chance to take the lead when Lopez attempted a pickoff of Lybarger, who moved to third after the ball was misplayed and went into center field. Lybarger rounded third but was thrown out on the relay from Lopez (2-0) to third baseman Jesse Flores. Meanwhile, Amezquita (3-3) was in control through the fourth inning before the Oilers took the lead for good, 2-1. Orozco singled and eventually came home on a fielders’ choice by right fielder Jaime Martinez (1 for 3, stolen base, two RBIs). Martinez singled in pinch-runner Andres Santana to give the Oilers a 3-1 lead in the sixth inning. “It’s always a great series (with Montebello), and our staff and their staff (have) been here a long time and they’re always close games,” Alhambra coach Steve Gewecke said. Alhambra at Montebello, 3:15 p.m.
Schurr at Bell Gardens, 5:45 p.m.
St. Paul at Bishop Amat, 3:15 p.m.
El Rancho vs. Whittier at York Field, 3:15 p.m.
La Serna at Santa Fe, 3:15 p.m.
Pioneer at California, 3:15 p.m. Sunny Hills at La Habra, 3:15 p.m.
Heritage Christian at Whittier Christian, 3:30 p.m.
Glenn at La Mirada, 3 p.m.
La Serna’s Moriah Earley took her game to another level as she emerged as the top player for a talented Lancer team. Earley scored a team-high 21 goals in helping to lead the Lancers to a Del Rio League title and the CIF-Southern Section Division 5 championship. One of Earley’s biggest moments came in La Serna’s 3-2 win over La Quinta in the Division 5 semifinals. She scored two goals with the latter being the game-winner. 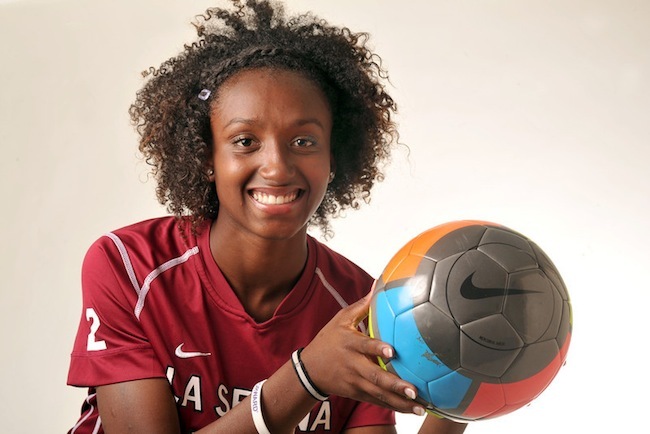 For her outstanding season, Earley was named the Daily News Girls Soccer Player of the Year. It was certainly a season of accomplishments for Earley, who was also named the most valuable player for both CIF-SS Division 5 and the Del Rio League. Earley followed up her heroics against La Quinta by scoring a goal in La Serna’s 3-0 triumph over Cabrillo of Lompoc in the CIF-SS Division 5 title game. As a result of the Lancers capturing the divisional crown, they earned their first berth to the CIF-Southern California Regional Soccer Championships. Earley, a four-year varsity player, recently committed to USC. Earley put together an impressive postseason for the Lancers, scoring six goals in as many games. Troglia guided a Lancers team that made its share of history this season. After capturing the Del Rio League title, La Serna went on to capture the CIF-Southern Section Division 5 championship by defeating Cabrillo of Lompoc 3-0. It marked the second time La Serna won a CIF-SS divisional crown with the first coming in 2008. As a result of their CIF-SS divisional triumph, the Lancers also qualified for the CIF-Southern California Regional Soccer Championships for the first time in school history. For her efforts, Troglia was named the Daily News Girls Soccer Coach of the Year. Troglia was also named the All-CIF coach of the year for Division 5.